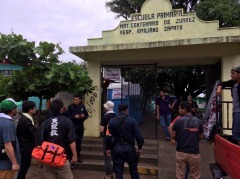 On the morning of 27 September 2017, AMDA-Tenrikyo joint team visited an elementary school which was used as an evacuation center in La Novena Seccion, Juchitan, in Oaxaca Province. Though the security was tightened for burglary prevention, the team was admitted to the facility after negotiating with the facility representative. The evacuation center had housed about 50 people, however, at the time the team visited, 2/3 of them were either out for work or out clearing the debris from the quake. Still, AMDA nurse eagerly checked the evacuees' health conditions by testing blood sugar levels or taking their pulse. She also gave health guidance as well. AMDA nurse completed her mission in Juchitan that day and returned to Mexico City at night. On the following day, she left Mexico for Japan and arrived in Tokyo in the afternoon of 29 September (Japan time). According to Comité Nacional de Emergencias, the total death toll has mounted to 355 while more than 8,000 people were treated at hospitals and clinics. AMDA will keep an eye on the situation as aftershocks are still continuing in the region. As for the volcanic eruption of Mount Popocatépetl which occurred on 27 September (located 70 km southeast of Mexico City), Centro Nacional de Prevención de Desastres has warned people to stay away from the mountain although no evacuation order has been issued. AMDA will monitor the situation and will be on standby if any needs arise.